so i just installed my SAFCII. i turn the key on (not the engine) + set it up. (i have a 91) so i set it to 06 in 06 out, flap type, 4 cyl, arrow up + to the right. then i turn the engine on. it starts up fine, then it kinda putters a bit so i give it some gas. under low throttle, its like the engine starts to die. i don't get it. then it did die. several times. i try both leaning it out, + making it richer. but nothing. Go back and look at the settings again to make sure they are still right. You probably already did that though. So if that's so, how about looking and seeing if the fuel has been messed with in the high and low settings. Like, are the settings for all the engine speeds still at zero? Should be if you havn't moved them. How about this?....Go to ETC and look at the Sensor Check area and see what the volage reading is for AF1 . With the engine OFF, key ON. The AF1 should be somewhere in the 4.5 vdc range. Then start the engine and with it at idle (around 750rpm) look at the voltage for AF1 again. It should be lower, around the 2.8vdc range give or take. This is what I see on a Series Four car and I doubt your S5 is much different. OR, since only one wire was cut on the harness, the one going to the air flow meter, splice it back together and start the engine and see if it idles better/runs better. 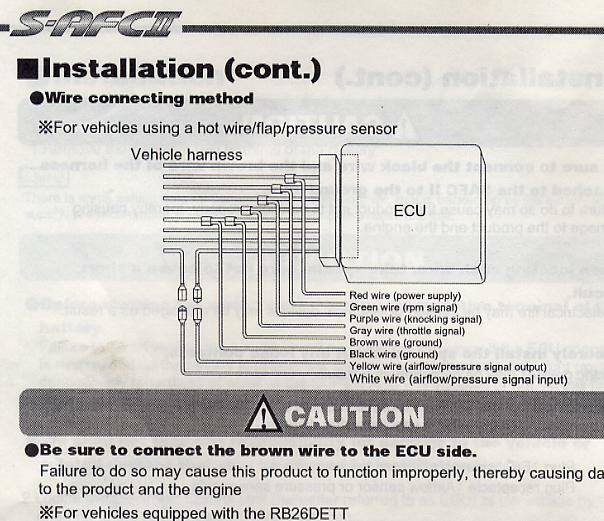 If it does, then there must be something wrong about how the wiring was spliced in to the ECU (guess). wait; so one of the wires has to be cut on the harness?? i just thought that you cut off the outer part of the wire, wrapped the SAFC wire around it + covered it. that's what i did. In the middle plug, there is a Green wire with a Blue stripe. You cut that wire about three or four inches back from the ECU'S middle plug. One end goes to the SAFC Yellow wire and the other end of that Green/Blue wire goes to the SAFC White wire. Jpg attached of the location of the wire. Third wire from the end on the top row. So you cut that Green/Blue wire about four inches from the plug. Now the SHORT piece of wire that is now four inches long and goes to the ECU plug, gets the SAFC'S Yellow wire connected to it. The other *half* of the Green/Blue wire will be connected to the SAFC's White wire. 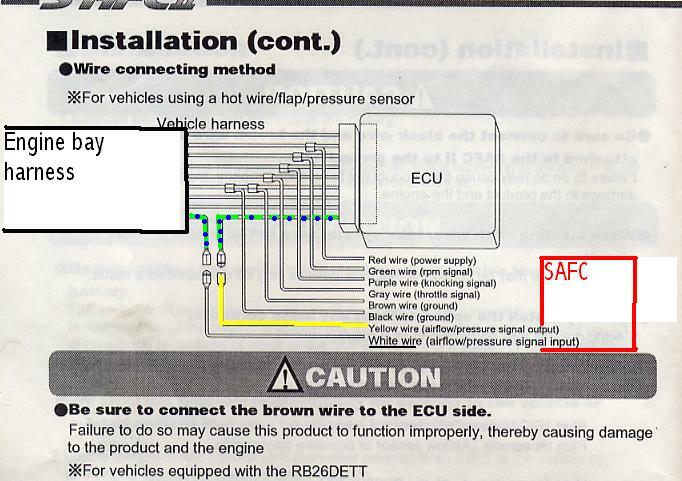 So what you have now is a Blue/Green wire that orignates at the AFM in the engine bay and will NOW go into the SAFC on the White wire, and then the SAFC will alter that signal and the output will come out on the safc on the Yellow wire and go to the ECU's middle plug at socket 2E. Last edited by HAILERS; 01-24-07 at 11:21 PM. wow thanks man. so can i just cut the wire that i have right now? or does it HAVE to be about 4 inches + everything. i think i spliced it close to the plug itself. No. I only said three to four inches back so you would have enough wire on the short end (plug end of the wire) to splice it back together if you ever sell the SAFC and want to go back to stock. Just easier to work with a longer wire than a stub of a wire near a plug. Last edited by HAILERS; 01-25-07 at 11:36 AM. okay so i cut that wire + made everything all nice. but i notice that its puttering around 50% throttle. is this another connection thing? No, that's not right. It could be one of two things. The TPS wire color is Green with a Red stripe and is in the middle plug. Make sure you tapped into that one. If that is right, then on the SAFC,. go to ETC and then to Sensor Check and view the voltage reading for the throttle position. It should read ONE volt. You can be off a bit and it won't matter, like reading 0.955 or something like that. The only wire at the ECU that gets cut is that one wire that is Green/Blue (GL), the other wires only get tapped into.. If the voltage reading at sensor check does not read approx 1vdc, then adjust the TPS screw til it does read one volt on the SAFC. One volt is what the TPS is supposed to read when at idle and the engine is fully warmed up. Any other reading under those conditions is flat wrong and will mess things up. but here's the only problem now. the tach is way off. i was at 5k + it said about 2000, when its at idle, it says 500 (thats about right) then when i'm at 2k it says about 1500. i dunno what to do about that. then when i hit full throttle, it didn't say 100% i went into the SAFC + set low throttle to about 20%. do i need to turn it down a bit so that when i hit full it says 100%? EDITED. The GREEN SAFC wire goes to the Blue wire with a Yellow stripe on the large plug of the ECU. Make sure it is installed good. No wires should have been cut except the one for the AFM which was that green/blue wire. The 100 percent thing...........are you looking at Monitor and the airflow percentage? If that is the case and it's not reading that, try this. Go to the afm and shove the flap all the way to the rear and hold it there. Look at the SAFC as you do that. Does it read 100 percent now??? If it does, the let the flap go all the way fwd and wait a moment then shove it all the way aft again. Repeat that several times. Then go for a ride. In second or third gear, redline the engine while driving and do that a couple of times. Did the afm percentage now go higher than it did in the past?????? If you look at the page of the SAFC called ETC and go to Snsr Check, look at the af1 voltage. It will be something like 4.6vdc if the key is ON and engine not running. IDle the engine and it should go to approx 2.8 vdc. Write back sometime and tell us what you read for both of these conditions (voltage at idle and voltage with key ON, engine OFF). By the way, where the high and low throttle set points are set have nothing to do with the percent the MONITOR shows for the afm being open. I'd go back and make sure the SAFC is set for FLAP and the arrow pointing up and to the right. It's possible a slip of the finger changed the FLAP to something other. IF it does not start working right, send it to me and I'll install it in my car to make sure it's not the SAFC that is acting funny. You pay postage. Last edited by HAILERS; 01-29-07 at 08:05 PM. when i hooked everything up, i used 1300cc's guide on how to do it. same settings + everything too. the only part i'm having trouble with is the RPM's are off somehow. i don't think it really matters that much since i'm not using that as a tach. I think I'm misunderstanding this a bit, so tomorrwo I'll go look at my SAFC screen and figure out what I'm misunderstanding. If it's not too cold. When your monitoring the correction, rpms, afm (or is it afl? on the screen?) and knock..............it's not unusual to see only 98 percent when the tps plunger is fully extended. What you might do is click thru the menu til you see the ETC and then under it there is a sensor check which shows voltages of the sensors. With the foot off the pedal and key to ON you should see right at ONE volt or maybe a bit under like 0.955 or so. That is with a fully warm engine. Then step on the pedal and it should go to maybe 4.65 volts or so. Maybe as high as 4.9v. Does that happen when you go to that page and look??? Something is not right with that rpm problem. It needs to be fixed because when you go to change fuel amounts, they are based on rpm ranges. Where you set the LO-Thrtl or the HI Thrtl should have no effect on what the Thr percent is shown when you view the MONITOR. If your seeing a difference of 100 % one time and the next time you see only 98 % when the pedal is fully down, I would not be concerned. It's just a slight variation in the TPS itself not worth thinking about. I might be misunderstanding a bit. It's late. Yeah, really need to fix that rpm thing. Wires soldered? Or have crimped connectors on them? I've done both in the past and settled on the crimped connectors so I can remove and repalce the thing at ease.. No side effects. I have a good ratcheting crimp tool and never pull connectors apart by holding on the wires, just the connectors themselves. the AFC isn't keeping my settings. i looked under the basic settings (4 cyl, arrow up + to the right, 06 in 06 out for flap type) + they were set as if i just turned it on for the first time. so here's my question, how do i save things? isn't there a save feature? i think i hit it once, but i'm not sure... initialize or something like that. i don't have a manual so i don't know what everything exactly does. Never hit INITILIZE or it will put the SAFC back to its initial readings when it came from the factory. Once you select FLAP,06-06, 4CYL you don't really do anything else. There's no *SET* button or anything like that involved. Once the selections have been made, a person SHOULD be able to remove the SAFC out of the car and install it on another car and on the *OTHER* car the same original selections should still be there. In other words losing power to the SAFC should not cause it to lose the settings you put in earlier. Last edited by HAILERS; 01-30-07 at 08:38 AM. You MIGHT have solved your problem with the question about INITIALIZE. You get two choices when on that INITIALIZE page. Either YES or NO. Select or page to NO and continure on from there. You never say YES to INITIALIZE unless you want to bring the SAFC back to the factory settings.